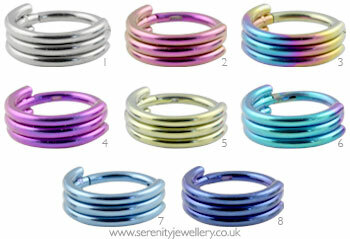 Hypoallergenic titanium hinged banded segment rings in 6mm and 8mm internal diameters. 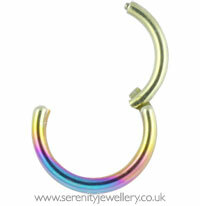 Please note: The hinged part is 1.2mm gauge and not thinner than the rest of the ring. 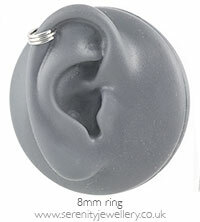 Neat little hoop that sits nice and snug. 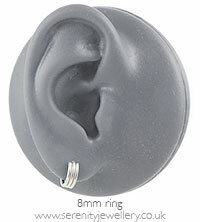 I actually bought this to wear in my seconds as they're sitting a bit low. 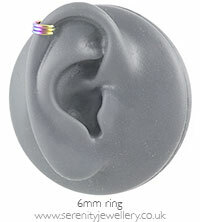 They're a little fiddly but lovely quality and the purple colour is stunning.